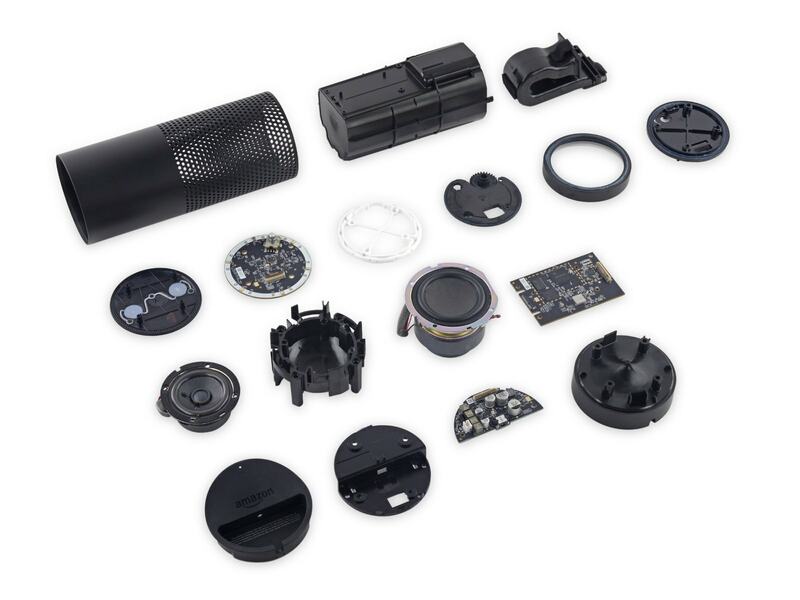 The teardown specialists at iFixit have gotten their hands on one of the rare Amazon Echo and much to everyone's delight they immediately voided the warranty. About the same size as two cans stacked one on the other, the Echo is a virtual personal assistant - a Siri in a can, as it were. But unlike Siri, which is engineered into a smartphone (and later, the iPad), Echo is not a mobile device but an appliance. All in all, the Echo is a simple gadget that isn't packed nearly as tightly as the Mac Pro which Apple launched last fall. That was a bigger cylinder, but it was also far more densely packed with a heat sink, SSD, and even a fan (to keep the desktop in a can from overheating, of course). Now that we know what's inside, what do you think of the Echo? Respect the Suits, Bring Back the Gatekeepers! I love it! Just the ability to add to my shopping list or figure measurement equivalents (hands-free!! )while cooking is worth it. I also like how I can switch between household accounts for music. Obvious improvements would be the ability to read audiobooks and give current sport scores. I agree, she’s definitely worth $100. Sometimes, she’s a bit wonky when you ask questions the wrong way. Even as a completely dumb appliance that played internet music, it would be a good buy. The speakers sound pretty good. I suppose that by 2016 we’ll see all sorts of moaning about Amazon’s monopoly in smart bluetooth speakers. Your headline suggests that Amazon padded out the device to make it bigger than it needs to be. I don’t see that in the iFixit article. The only significant “empty volume” seems to be the saxophone-shaped reflex port used by the woofer to improve bass. That tube fits in the plastic cylinder in the back row, actually. I’m not sure what that tube is called, but the cylinder is a baffle. It is empty space. I concur on reading books and audio books and sports scores (apparently Tottenham Hotspur is a bridge too far for Alexa). I’d also like it to be able to send me email reminders, and I’d like to change her name. Tell Amazon, if you haven’t. Alexa is not the only one listening. Whatever your other virtues may be, you don’t have a clue about acoustics. A baffle is not empty space. It is full of air, the main transmission medium of sound, and is performing a needed function. There are many years of math and several of physics between you and an understanding of what is necessary in a sound system. It’s way above your pay grade. By most definition, a volume filled with only air is empty. I’ve found an alternative which works just as well, so I’ve changed the title.